Varifocal lenses offer maximum flexibility in camera installations requiring a wide range of focal length adjustments. Focal length adjustments can be made with a turn of the dial, virtually eliminating the cost and inventory problems associated with improper monofocal lens selection. 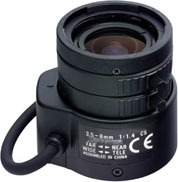 All lenses are CS-Mount, comprised of all glass optics and come with a durable metal barrel and mount. Two versions are available - Manual or DC driven Auto-Iris lenses. An Auto-Iris lens automatically detects the amount of light entering the lens and adjusts accordingly to allow just the right amount of light to provide you with a clear view. They are ideal for outdoor applications. If the light is always the same (such as in most interior applications), a manual or fixed iris lens is appropriate. If you don’t see the lens you need, do not dismay. We can provide you with any CCTV lens for any application. Simply contact us. Give us the dimensions of the area you want to view (Height X Width) and how far away the camera will be from the center of that view. We’ll tell you what lens you need and provide you with a few options. This lens enables you to view an area 10' wide X 8' high from a half mile away (2,640 feet). The lowest setting (120mm) will provide a viewing area of 8' wide X 6' high at a 200' distance. Up to 150x magnification on 1/3" CCD sensor , Has variable f-stop adjustment , Allows fine adjustments to back focus , includes eyepiece to use as telescope. For the ultimate in surveillance lenses, the HD-LVM1200 offers a CS mount and standard 1/4" mount on its center ring for tripod mounting. 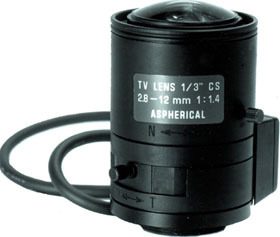 Designed for 1/3 inch CCD cameras. The front ring adjusts the zoom, center ring adjusts iris and back ring allows back focus adjustment. Lens is 17 inches long and weighs just 3.3 pounds. The Day/Night Cameras which function as color cameras in the daytime and high-sensitive monochrome cameras in the night, now come onstage as the surveillance systems expanded in their applications from the daytime to the night. However, ordinary lenses do not reproduce crisp images under IR Illuminations as sharp as the images under visible lights during daytime. That is due to chromatic aberration that causes the shift of focusing points under visible lights and IR Rays. This Day/Night lens is chromatic aberration corrected extensively in a wide range from visible lights to near IR Rays and is designed to reduce the focus shift to the unrecognizable level. It displays outstanding optical quality and performance in the range from visible lights to near IR Rays. Send mail to webmaster@allaboutvideo.com with questions or comments about this web site. Copyright © 2005 All About Video. All rights reserved.